The LA Rams celebrating their victory over the Saints to book their place at the Super Bowl. SUPER BOWL FINALISTS the Los Angeles Rams will feature in one of four NFL games that will be played in London in 2019. Wembley and Tottenham’s new stadium will host two games each as part of the NFL’s international series, while another fixture is billed for Mexico City. Along with the Rams — who will face the New England Patriots at Super Bowl 53 –seven other NFL sides have been selected for the London fixtures. The Carolina Panthers will take on the Tampa Bay Buccaneers while the Oakland Raiders have been paired with the Chicago Bears. The Cincinnati Bengals and the Rams will also square off, while a clash between the Houstan Texans and Jacksonville Jaguars completes the list of fixtures set for England’s capital. Mexico City’s Azteca Stadium will host the other international game, where the Los Angeles Chargers will take on the Kansas City Chiefs. The Chiefs narrowly missed out on a spot at this year’s Super Bowl after an over-time thriller against the Patriots in the American Conference final on Sunday. 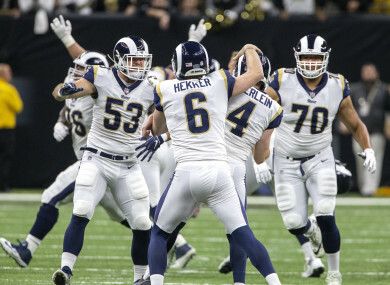 The Rams booked their place in the NFL’s showpiece game after a controversial victory over the New Orleans Saints in the NFC championship. Rams cornerback Nickell Robey-Coleman appeared to have committed a pass interference on Saints wide receiver Tommylee Lewis late in the contest, who looked to be on course to score a winning touchdown. The officials however, didn’t spot any offence and the game went to over-time where the Rams were victorious. Further details for the London ties will be announced later this year as part of the full NFL schedule release. Email “Super Bowl finalists among 8 NFL sides announced for London fixtures in 2019”. Feedback on “Super Bowl finalists among 8 NFL sides announced for London fixtures in 2019”.